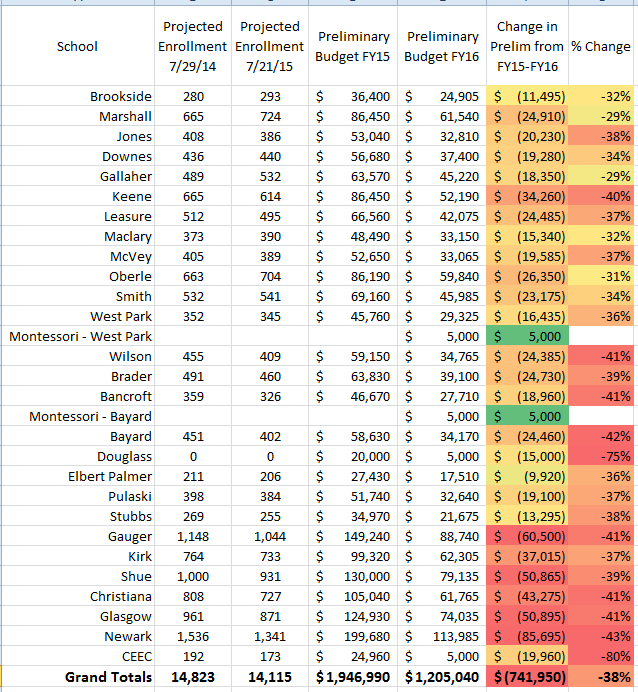 Comparing last year and this coming school year as far as enrollment and discretionary building budgets, the overall picture gets gloomier. It is important to remember that projected enrollments are always lower than what the actual numbers will be come Sept. 30. How much lower is what we really need to look at. In this table (color scale is mine) we’re looking at decimated discretionary building budgets from 2014-15 to 2015-16. Enrollment numbers are very surprising as well. We’re looking at a preliminary reduction of almost $750,000 and a loss of 708 students. I know looking at tables and colors and numbers everywhere is confusing as all hell. I’ll try to help. 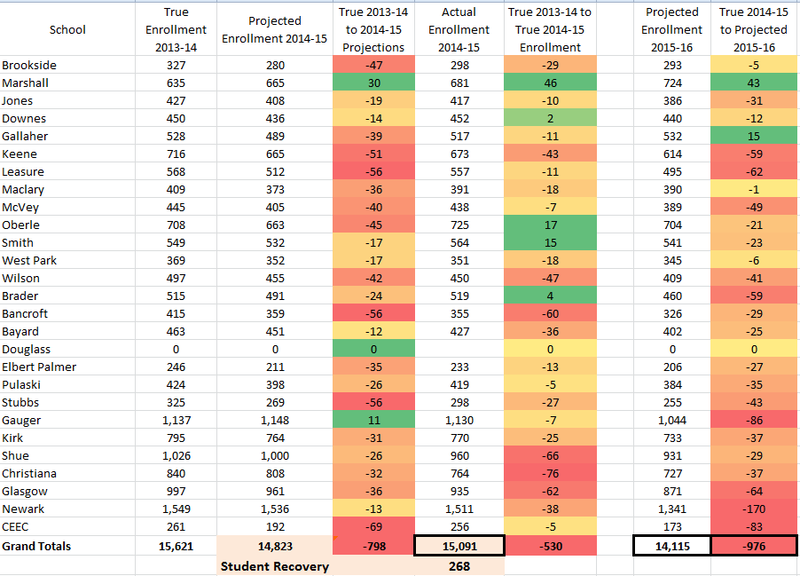 From 2013-14 to 2014-15 the District initially was projected to lose about 798 students, they actually lost 530. (Shown as Student Recovery: 268). From 2014-15 to 2015-16 CSD projects a loss of 976 students. Obviously we’re not at September 30 yet, so we don’t know what the actual numbers will be. But assuming CSD recovers the same number of students, it’s still down around 700 students. You can see the District consistently projects losses greater than what they actually turn out to be which, for budgeting purposes, makes some sense. But the hard truth of the matter is that CSD continues to hemorrhage students and continues to operate the same number of buildings. Some big, drastic changes are in order. The final piece of the financial mess is factoring in the Charter growth and cost. I’m writing that now. Please keep in mind, all of this is preliminary. We have no idea what things will look like in September. And the budget is still a proposal at this point in time, subject to CSD Board of Ed approval tomorrow night at August General Business meeting. I thought discretionary budgets were already cut as a result of the budget shortfall. How it gets allocated to the schools is based on the enrollment figures – correct? Correct Guy. Discretionary budgets are at the top of the list when trying to close a budget and we knew they were getting cut. Now we have some idea of how much they’re being cut.